Facing anger over the deadly school shooting in Florida, United States President Donald Trump has directed the Justice Department to consider banning bump stocks, the controversial device that turns semi-automatic rifles into fully automatic weapons capable of firing hundreds of rounds a minute. Trump on Tuesday said he signed a memorandum directing the Attorney General Jeff Sessions to propose regulations to ban all devices that turn legal weapons into machine guns. "I expect that these critical regulations will be finalised, very soon," he said. The move comes in the wake of the deadly shooting at a Florida school last week that killed 14 students and three teachers, renewing a debate over gun control. 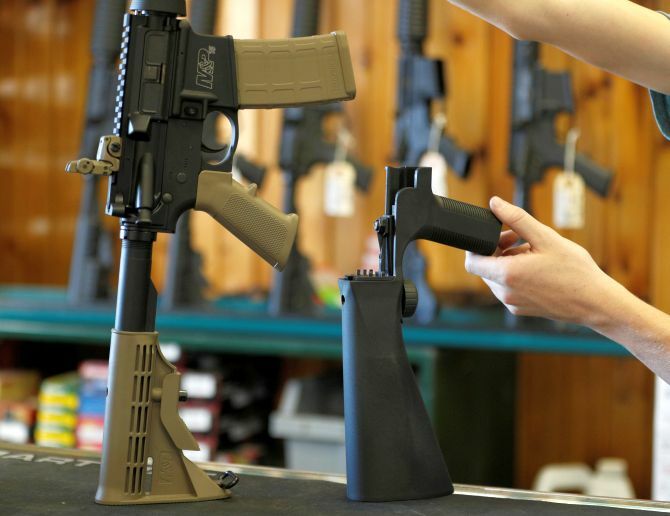 Bump stock devices were not used in the Florida school shooting but it became controversial after the Las Vegas mass shooting in October last year in which the gunman used the device and killed nearly 60 people. "After the deadly shooting in Las Vegas, I directed the attorney general to clarify whether certain bump stock devices, like the one used in Las Vegas, are illegal under current law. That process began in December," Trump said at a White House event. "The key in all of these efforts, is that one cannot merely take actions that make feel like they are making a difference," he said. "We must actually make a difference. We must move past cliches and tired debates and focus on evidence-based solutions and security measures that actually work, and that make it easier for men and women of law enforcement to protect our children and to protect our safety," said the US president. In a memorandum, Trump said although the Obama administration had repeatedly concluded that particular bump stock type devices were lawful to purchase and possess, he sought further clarification of the law restricting fully automatic machine-guns. Accordingly, following established legal protocols, the Department of Justice started the process of promulgating a Federal regulation interpreting the definition of "machine-gun" under Federal law to clarify whether certain bump stock type devices should be illegal. The Advanced Notice of Proposed Rulemaking was published in the Federal Register on December 26, 2017. Public comment concluded on January 25, 2018, with the Department of Justice receiving over 100,000 comments. "Today, I am directing the Department of Justice to dedicate all available resources to complete the review of the comments received, and, as expeditiously as possible, to propose for notice and comment a rule banning all devices that turn legal weapons into machineguns," Trump said. According to The Washington Post, the move to ban bump stocks may upset the pro-gun lobby group National Rifle Association, which is one of Trump's strongest supporter. The Justice Department said "this is a priority for the president" and it has acted quickly to move through the rule-making process. "We look forward to the results of that process as soon as it is duly completed,â€ it said in a statement.